The Y-SNP calls for the Grotte du Bichon genome are here. The Grotte du Bichon sample is from the skeleton of a hunter-gatherer found in the Grotte du Bichon, a cave in the Jura Mountains of Switzerland. 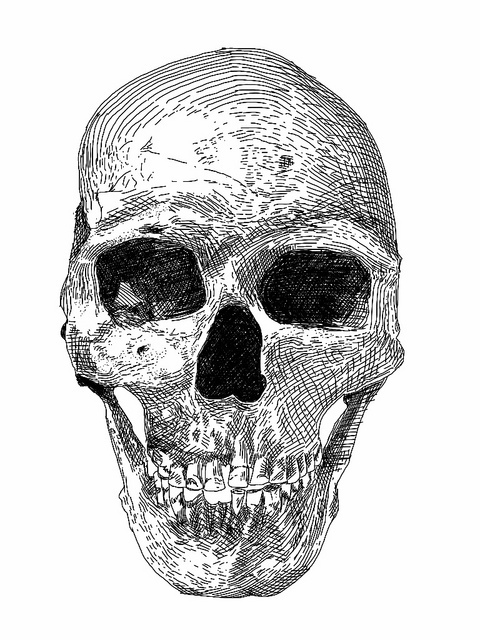 The skeleton was dated to 13,560–13,770 BP, during the late Upper Paleolithic. The calls show that the Grotte du Bichon hunter-gatherer belonged to Y haplogroup pre-I2a1a2a1-L1287. This is the same haplogroup that was found in the Mesolithic Swedish hunter-gatherer Motala 9, the three Swedish hunter-gatherers Ajvide 52, 58, and 70 of the Pitted Ware culture, and the two Hungarian samples KO1 and NE7, from the Neolithic Körös and Lengyel cultures. The human skeleton was determined to be of a young male, 20–23 years of age, of the Cro-Magnon type. According to the cranio-facial architecture, it was characterized by classical cranio-facial disharmony, i.e. 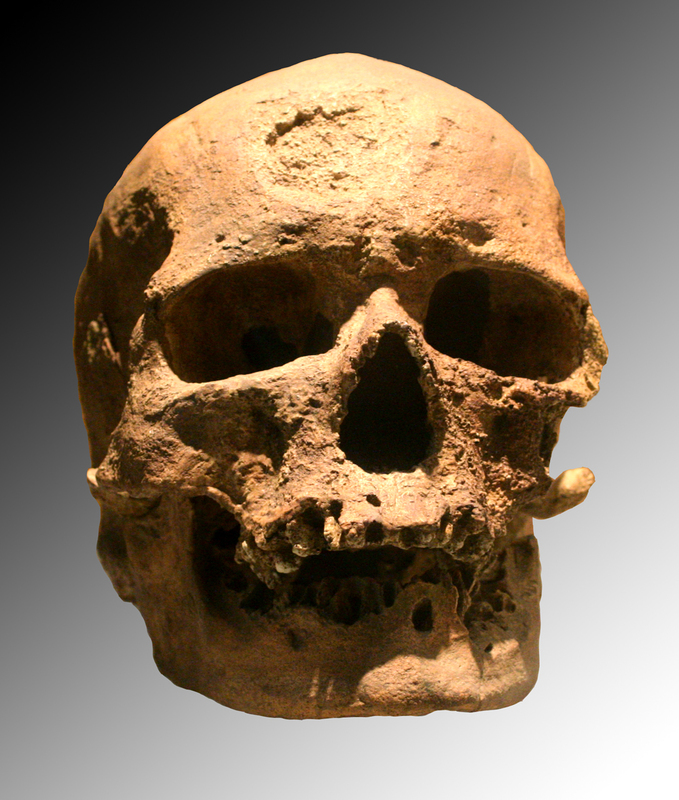 a relatively long skull associated with a low face and sub-rectangular eye-sockets, which are quite typical of the time period. The young man weighed a little over 60 kg and stood 1.64 m tall. Although of a relatively slender build, muscle attachments showed him to have been a strong runner and well adapted to mountainous terrain. His upper limbs show a high degree of asymmetry, indicative of preferential use of the right arm. Isotopic studies of carbon and nitrogen fractionations indicated a largely meat based terrestrial diet. In this comment from April 7th, 2014, I said that I thought that the Aurignacians belonged to Y haplogroup I, and that haplogroup I people originally had the eurymorphic (short-and-wide-faced) cranial morphology of the Cro-Magnon 1 skull, and that the Gravettians belonged to Y haplogroup R, and that haplogroup R people originally had the leptomorphic (long-and-narrow-faced) cranial morphology of the Sungir 1 and Predmost 3 skulls. The Grotte du Bichon genome shows that I was right about the original cranial morphology of haplogroup I people. I’m confident that a Gravettian genome will show that I was also right about the original cranial morphology of haplogroup R people. What are your thoughts on the Solutrean? I am thinking the origin of C1a2 y haplogroup in Kotenski and La Brana? I think that Western Europe has been predominantly R1b since the Gravettian, so I think that the Solutreans were also predominantly R1b. Kostenki 14 was C1b1-K281*, so he wasn’t ancestral to C1a2. 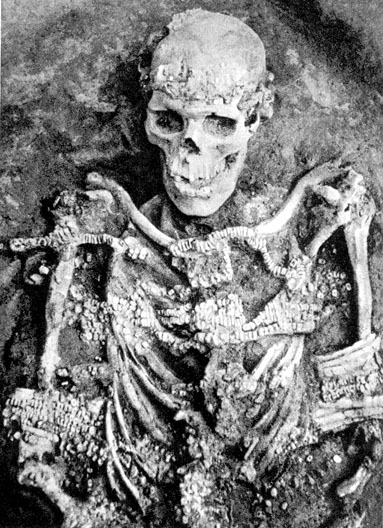 The La Braña skeletons were found around where the Asturian culture was located, so C1a2 may have been associated with that culture. Asturian tools were more primitive than the microlithic tools of the other contemporary Mesolithic Western European cultures. 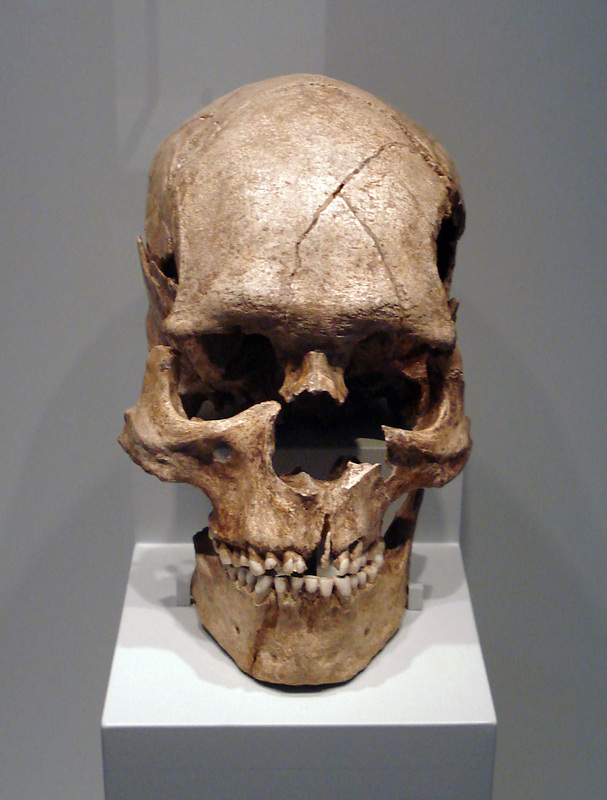 The leptomorphic Combe-Capelle skull was dated to the time of the Sauveterrian culture, and it was found around the place where that culture originated, so I think that the Sauveterrians were R1b-M269. The later widespread Tardenoisian culture was derived from the Sauveterrian, so I think that the Tardenoisians were predominantly R1b-L23. I think that the spread of the Tardenoisian culture down the Danube and into Southern Russia is what brought R1b-L23 to Eastern Europe, in the form of R1b-Z2103. Do you know of any Native Americans that are R1b-M269 that have tested further down from there on the SNP tree, and if so what the results were? So what is your opinion on this whole “CHG” / “WHG” / “EHG ” / “ENF” / “ANE” business? Wrong? As I pointed out in this post from over a year ago, the “WHG” (“West European Hunter-Gatherer”) and “ANE” (“Ancient North Eurasian”) names are idiotic. KO1 is autosomally similar to Loschbour, La Braña 1, and Bichon, but he lived in Hungary, which is part of Central Europe, not Western Europe. Luxembourg, where Loschbour lived, and Switzerland, where Bichon lived, are also often considered to be part of Central Europe rather than Western Europe. KO1, Loschbour, Bichon, and the Swedish hunter-gatherers belonged to I, and the distribution of I makes it clear that it spread from the Ice Age refuge in the Balkan peninsula north through Central Europe and into Scandinavia. The discovery of I and C1a2 in the Neolithic samples from Asia Minor is further proof that those two haplogroups spread from an initial concentration in Southeastern Europe, just as I said in my post from over a year ago. As I said in the comment above, I think that the Sauveterrian and Tardenoisian hunter-gatherers of Mesolithic Western Europe were predominantly R1b, and I think that their autosomal DNA will be found to be partially related to hunter-gatherers like Loschbour, and also partially related to the R1b and R1a hunter-gatherer samples that we currently have from Russia. The problem I see with this explanation is that archaeologists point overwhelmingly to Franco -Cantabria as the source region for recolonisation of post-glacial central and Northern Europe; not southeastern Europe (“the Balkans”). Figure S40 in the supplemental figures of this paper shows a new branch of R1b-DF27 in a couple of Colla Indians from the Andes of Argentina. Most of the R1b-M269 in Amerindians is probably of post-Columbian origin, but I have no doubt that some of it, such as that found in the “Gringuito” descendants of the Chachapoyas, and in some native Easter Islanders, is pre-Columbian. R1b-M269 or pre-R1b-M269 originated around 15,000 years ago, so if the Solutreans were R1b, they must have been some earlier form of it. Y-SNP data for a large set of Amerindian samples, especially from the United States, would probably turn up some very interesting things, but such data are impossible to come by. Interestingly, the haplogroup I-rich Swedes of today do not really show that Cro-Magnon type but are instead closer to the Combe Capelle type. On the other hand many Eastern European show a reduced and altered Cro-Magnon phenotype. 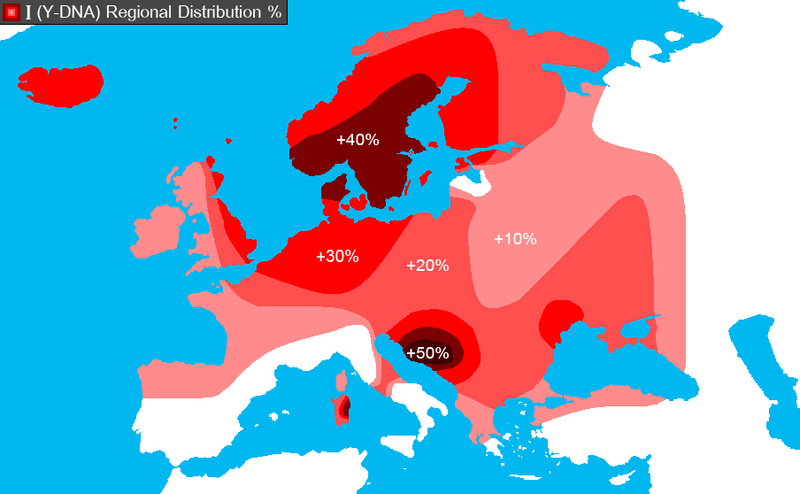 People with pure Cro-Magnon looks are more found in the German uplands (but could be connected to I people, no doubt) and occassionally North Africa. From the books I have read Anthropologists state that the people of Dordogne France have the greatest similarity to Cro-Magnon, which is exactly where the Lascaux Cave paintings and Cro-Magnon 1 were found. If there had ever been a single, distinct, and well-defined material culture that spanned the Franco-Cantabrian region, Central Europe, and Scandinavia, then I might be persuaded, but there never was any such culture, so I’m not. The Ahrensburg and Maglemosian cultures did, however, span both Central Europe and Scandinavia, which supports my belief that Scandinavia was populated largely by haplogroup I people from Central Europe. Everything we know about haplogroup I points to it having spread exactly as I’ve long been saying, from the Balkans, through Central Europe, to Scandinavia. The distribution of I makes it clear. The prehistoric data also make it clear. We have I2c from Neolithic Asia Minor, early Bronze Age Germany, and Mesolithic Sweden. We have I1 from early Neolithic Hungary and Mesolithic Sweden. And we also have I2a1a2a1 from early Neolithic Hungary and Mesolithic Sweden. None of those three branches of I have been found in prehistoric Western Europe. Of course no conclusions can be reached given the lack of Palaeolithic samples from Europe, but yes, I2c and I1 are probably a eastern – southeastern European markers. But I’d content that I2a1 came from the west. According to archaeology, the populating groups and cultures which then re-expanded into Britain, Scandinavia and central Europe alike all came from southern France. You keep repeating this assertion, but I’ve never seen any evidence for it. Another assertion for which I haven’t seen any evidence. But I’d content that I2a1 came from the west. There’s no evidence for such a notion. If I2a1 came from the west, then the highest frequencies of I2a1 should be in Western Europe, and there should be a decreasing frequency gradient from west to east. That’s not at all what we observe. What we observe is that the highest frequencies of I2 are in the Balkans, and the frequency decreases with increasing distance from the Balkans. That’s exactly what would be expected if I2 spread across Europe from the Balkans. The haplogroup that does have exactly the distribution which would be expected for a haplogroup that spread from the west is R1b. Would you say that Nordics are basically autochthonous developments or that they needed Neolithic Mediterranean admixture to emerge? My latest K = 15 admixture analysis shows that 50–70% of Northern European autosomal DNA is from Paleolithic and Mesolithic European hunter-gatherers. That leaves a significant amount that’s from Neolithic sources. Thanks! I was more talking about the physical type (“Nordids”), as influence of Alpines and Mediterraneans in Scandinavia is obvious. Is it spreading misinformation again? It’s just more of the usual worthless, erroneous blather from the race-mixing wog Newamul “Razib” Khan. This is the same wog who in this post reacted with glee to David Reich’s preposterous claim that Northern Europeans have “Northeast Asian-related admixture”, and put up a picture of the Mongoloid-looking Bjork as being representative of all Northern Europeans. The title of the post you mention, “The Gaels Were from Scythia”, is nonsensical and idiotic. In the post he perpetuates the same falsehood perpetuated by his ignorant buddy Greg Cochran, that the Mesolithic European hunter-gatherers were “by and large” dark-skinned. Both the SLC24A5 and SLC45A2 depigmentation mutations were present at high frequencies in the Swedish and Russian hunter-gatherers. The SLC24A5 mutation was present in the hunter-gatherer-like Hungarian sample KO1. According to the available data for the 17,000-year-old Siberian hunter-gatherer Afontova Gora 2, he also had the SLC24A5 mutation. The website the post appears on is the premier website of the “HBD community”, and it’s run by a Jew who is openly hostile to White Nationalism, which is the only political movement that truly seeks to advance White interests.